What’s not to love about latex paint, I use it all the time. I have hundreds of latex paint furniture projects under my belt. Don’t let anyone scare you away from using it on furniture. It works great. 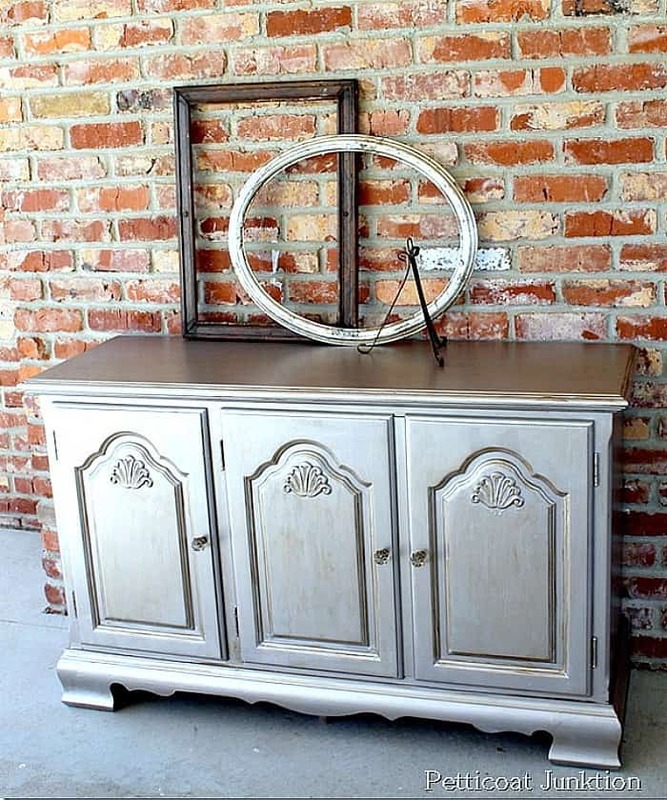 I gathered a list of latex paint projects that will make you want to grab your paint brush. Don’t run off early. 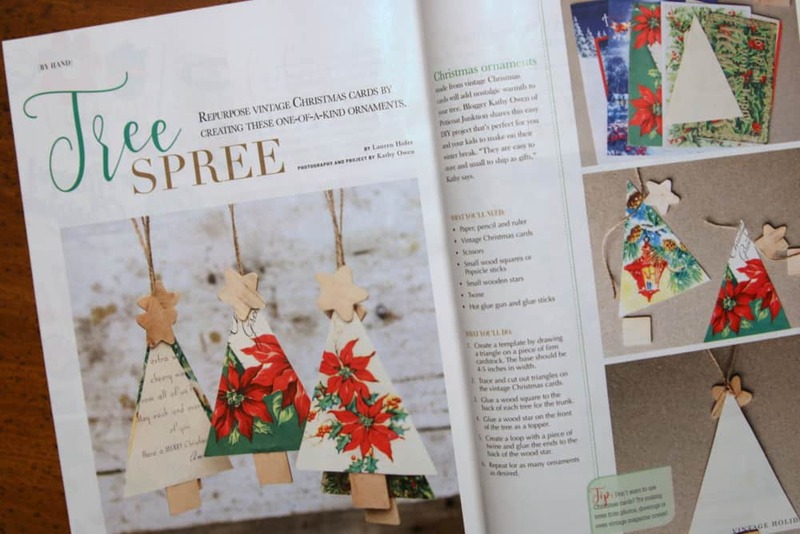 At the end of the post is the link to the craft giveaway and I also have a project featured in a magazine that I wanted to share with you. I am sooooo excited. Paint Furniture Using Latex Paint! I love metallic paint. You can use it in any room of the house. You can dress it up and you can also use it in a comfy, cozy, casual room. The piece above is painted with Martha Stewart Special Metals and they don’t make it any more. I recommend using Modern Masters Metallic paint. Distressed to the max. This one may not be for everyone. The stenciled numbers were an afterthought. A good one. I wish I could tell you the color of this paint but I can’t. This project is from my beginning days of blogging and I didn’t note the paint color. I’ve recently tried to find a similar color and I may have…..stay tuned. 4. Yellow Credenza. This piece started life as office furniture. It looks much better now. 5. Gray Furniture for the Boys. Custom painting is not for the faint of heart. I have to say that all my customers have been really easy to work with and happy with their painted furniture. I hear horror stories from some custom painters. The gray set of bedroom furniture got a bit of yellow paint on the backs of the bookcases for pizazz. 6. Sassy Green and Turquoise Buffet. This is one of my favs. I’ve never been able to repeat the look. One of a kind for sure. The buffet sold the same day I took it to the shop. 7. Fuchsia Going in Circles Desk. Fun and colorful. 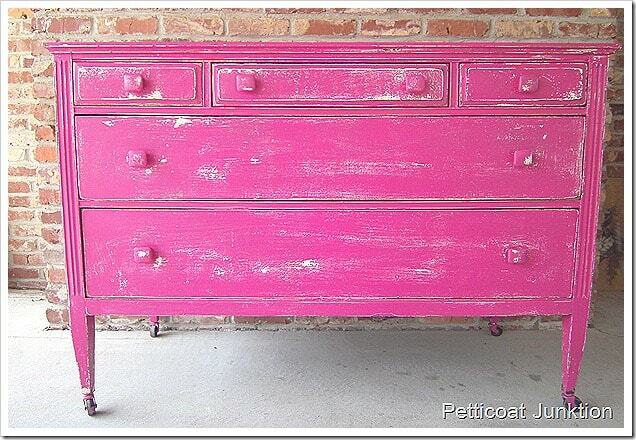 The desk is painted a bold fuchsia or hot pink and the drawer fronts are decoupaged with fabric. 8. 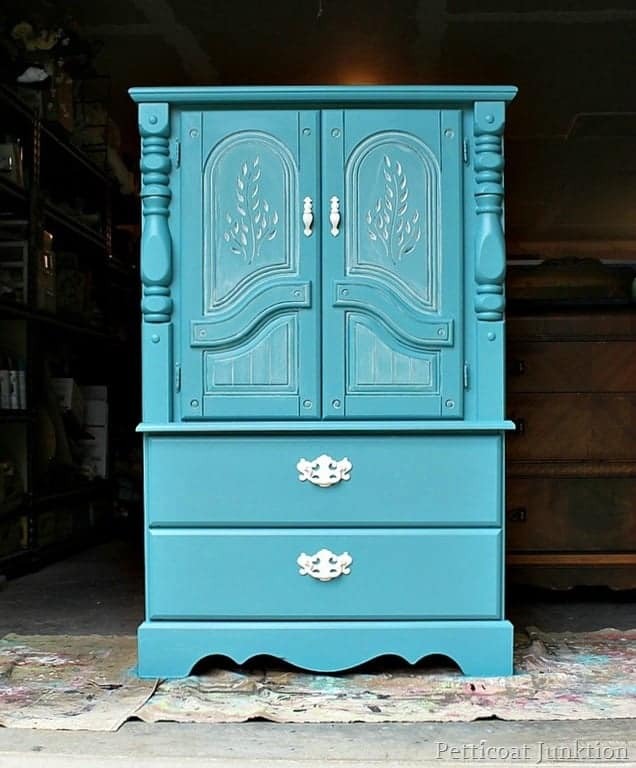 Stenciled Turquoise Wardrobe. This piece got stenciled inside and out. Perfect for any one, young or old. 9. 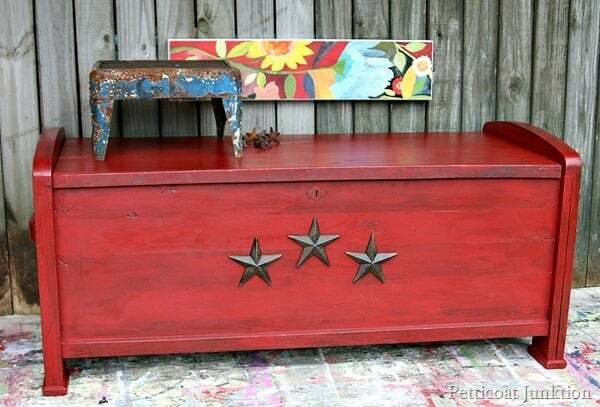 Red Cedar Chest Antiqued To Look Old. Red is one of my favorite paint colors. I mixed this color myself from leftover paints. I loved it so much I took a sample to Home Depot and had them mix a can of latex paint in this color. I call it Junktion Red. 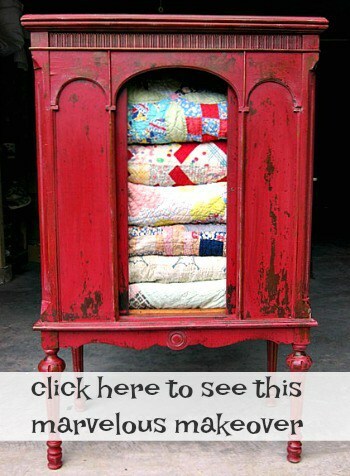 You can find the custom mix color code on my blog post here….Petticoat Junktion Red Custom Paint. 10. Dreamy Blue And White Bedroom Furniture. More custom furniture. These pieces were for a young lady going off to college. 11. Diva Glam Makeover. 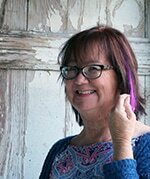 I love this fuchsia color and I’ve used it more than once. In this post I also show you how to use a paint sprayer to apply clear sealer to the finished paint project. Easy Peasy. 12. Nautical Style Furniture Makeover. The chest looks pretty with the red stripes and blue knobs. 13. Vintage Dresser Stool. Well, the white latex paint is pretty but the fabric I used to re-cover the stool seat is even better. Red and white, that’s all I’m saying. 14. Coastal Chic. Nothing classier than simple white. Wicker and white paint go together like peanut butter and chocolate. The wicker chest would be perfect in a beach house or in a little girl’s room anywhere. 15. 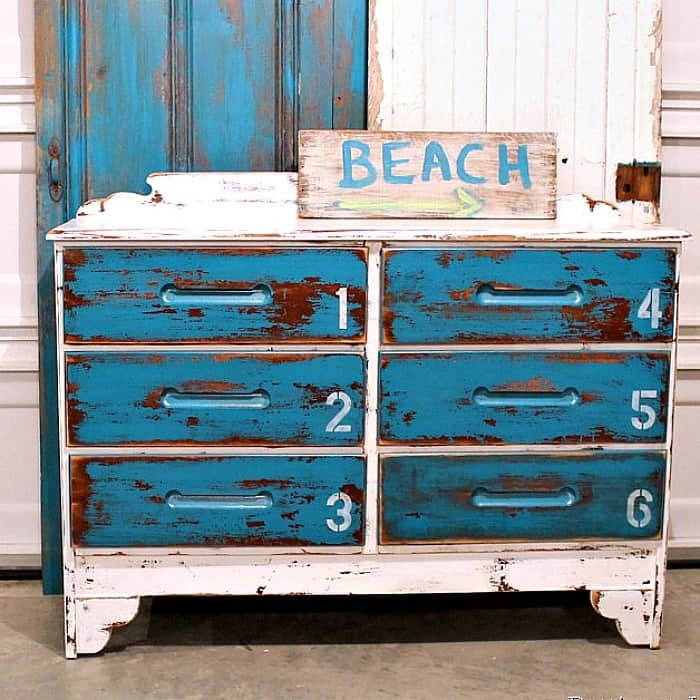 Blue Paint & White Wash Chest. What a pretty blue. The detail doors on the top part of the chest called for something extra, make those details pop. White wash was the perfect answer. 16. Highly, Highly Distressed Chest. Yep, this one stirred up some controversy but I was patting myself on the back. I never know what a project will look like until I’m finished. Sometimes I’m happy with the results and sometimes not. I’ve repainted furniture I don’t know how many times because I didn’t like the finished product. This one I loved but others didn’t. To each his own. Read my top reasons for using latex paint here….10 Really Good Reasons To Paint Furniture With Latex Paint. You can go to any hardware store and purchase latex paint. You may have latex paint left over from home improvement projects. If you haven’t yet painted a piece of furniture and are maybe scared to give it a try, grab that leftover paint and a small piece of furniture and go to work. 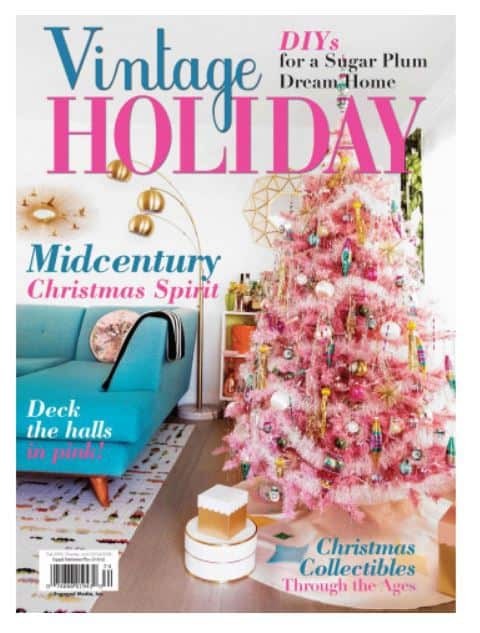 Next up….my project featured in a magazine. Yipee! The Christmas ornaments I made from vintage Christmas cards are featured in this month’s Vintage Holiday magazine. I made the ornaments a couple of years ago and the editor of the magazine contacted me to ask if they could feature it and if I had the original project photos, yes and yes. I have painted many pieces of furniture. I started with latex with a satin finish before I ever heard of chalk paint. I always used a primer first. Then if it was a piece that was going to get a lot of use, I sealed it with polycrylic I love the chalk paint called Rethunk Junk. It dries with a slight satin finish and doesn’t require a wax or primer. In fact, I have never used wax. I always use polycrylic because it is so easy to apply. Also, if I am going to do any distressing after using chalkpaint, I use a damp rag to wipe away the paint on the areas I want to look old. No sanding or dust to deal with. Of course, if using latex you would have to sand off the areas you want distressed. Interesting experience…my first try at DIY chalk paint on a vintage oak buffet made the top sdurface matte as I wanted, but any and all imperfections in the wood came blasting thru….I painted over that with Flat Latex and had the same matte finish…but it his those imperfections like A Boss!! So…Have just used Flat Latex ever since…and as everyone noticed…no need to wax or seal much…unless you want that little bit of sheen…. Yes, I love latex paint. I was never a fan of chalk paint until I used the FolkArt Home Decor Chalk and I love it. It’s not like any other chalk type paint I’ve used. Congratulations for being featured! One of my favorite magazines. What a great round up of some of your latex projects Kathy. I love that you will try out different techniques and colors on these pieces too. Your Junktion red created color is just great. Love all. Congrats on being in the magazine! I have been wanting to paint my kitchen table and chairs for quite some time and do not want to use chalk paint, due to the waxing. I’ve been thinking about latex, but I need your advice on prep, etc, anything that will make me happy with painting it. The set is oak and I’m over oak. Any advice will be so helpful. 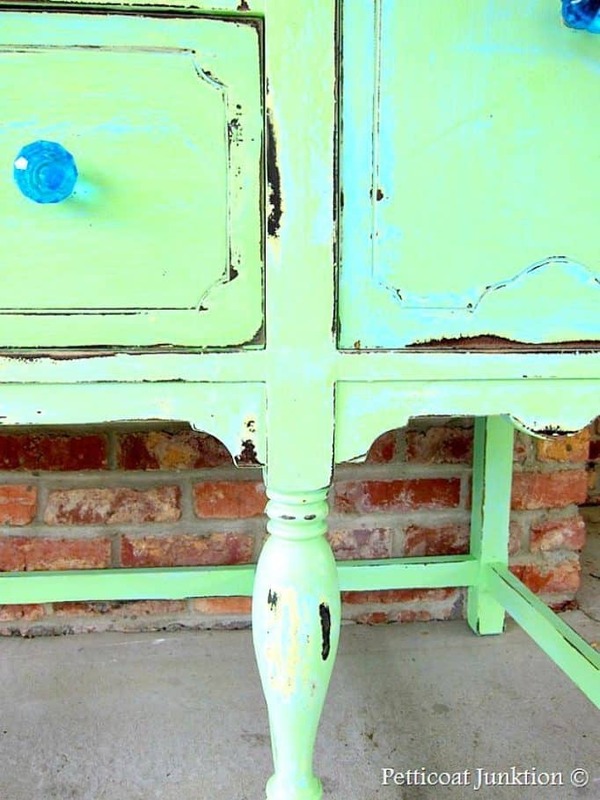 You can use a chalk paint without waxing. I hate waxing and due to failing health I just don’t have the stamina for it. I use Varathane Soft-Touch Polyurethane in Matte. It has a soft, wax-like feel, leaves a glow to your furniture and is more durable than wax. I apply it with an Applicator Detailers Sponge. Easy Peasy! I use Valspar latex paint on all my furniture. I love it. I can sand it with a fine sand paper and achieve a chalky look. Customers ask me all the time if it is chalk. I do mix my own chalk paint- latex paint & plaster of paris & water. I have used that with milk paint too for touch ups and it blended in. I have been using Latex paint also but am not happy with the stickiness and the peeling it does. I have a customer that likes just painted! NO distressing. It gets stressful trying to get that just perfect paint job, main reason I love to distress furniture! Hides so many imperfections in the piece. Thank you for all your wonderful information and pictures! And funky colors too! I use latex paints all the time after “scuffing” the surfaces up abit. Two light coats then waxing over that. I don’t mind the waxing step at all. I’ve used this technique to paint seedy-looking oak cupboards in bathrooms (after scrubbing off 20 years of grime)and am more than pleased with the results. This is the last home I’ll have, semi-retired now, so I’ve lots of time to play with design, decor and paints. Love seeing all the thoughts displayed through the many blogs I find here. Yes, I love latex paint. It has improved so much over the years. Of course, I like just about any kind of paint. Do you know if you can paint latex over chalk paint? I tried ASCP and hate the waxing part so I’m going back to latex, but do I have to sand it first? I only used a little wax because it got streaky and I hated how it looked. Thank you for any thoughts! Are you sealing the latex paint on the dresser or bedroom furniture? If so, with what? If not, will it chip and peel? Also, what is your favorite latex paint brand and finish (egg shell?) to use? Can I use a latex Sem.gloss firest and then put a Chalk paint over that? Started experimenting a little more with latex paint again. I found that the Valspar Ultra, goes on like butter. Love the way it paints on! Mostly using flat and sealing it with wax and hemp oil. Satin is still a little too shiny for me, but I can see that you won’t need wax or anything else with it. Going to try Eggshell soon. Don’t know how the latex finishes hold up over time concerning chipping and peeling. Would love to learn more from experienced furniture painters. Nice to find you online today! Now, I need to know is Martha’s Metallic paint better than Modern Masters? I notice a lot of people use hers and say it’s the best! I use latex to make my own chalk paint….ASCP is way to expensive for me! I love the waxing process, so it is pretty much all I use. I havent’ used just straight latex in years, though. I need to try mixing my own chalk paint. Would you share your recipe? I order “Webster’s Paint Powder” online & add it to my own paint to make “chalk paint” and LOVE it! Much smoother finish & a whole lot cheaper than Annie Sloan or any over the popular name brands out there. And then one is not limited to only certain color choices. You can get a true black instead of the grayish black in the Annie Sloan. I use this recipe for chalked paint: 2 tablespoons calcium carbonate powder (any brand) with 1 tablespoon water, mixing well. Add to 1 cup (8oz) paint (any brand) and mix well. I’ve used Waverly wax (water based) or Polycrylic to seal. Using the wax on several large pieces hurt my wrist too much, so I don’t use it on everything. Waverly also makes a varnish that’s good too. I love using Pixie Dust Paint Company’s Liquid Pixie to make my own chalk paint. It’s very cost effective, easy to use and gives you all the benefits of a chalk style paint with great adhesion in any color you like. It’s a liquid so when you sand the paint for a smooth finish you don’t get hte little white dots in the paint that you get from powdered formulas.A little FYI – no matter how well you mix the powder formula, calcium carbonate, or Plaster of Paris, you will get those annoying white dots because, even when mixed completely in water, the molecules are attracted to each other and they will group back together leaving those tiny white dots. Liquid Pixie has solved that problem. It’s amazing stuff! Wow, thanks for all of the info! I returned the Pantone at Lowes—hated the stuff. I think their regular latex paint would have worked better, but I do like the chalk type paints offered by different companies for furniture. Yes, latex paints do seem to stay sticky. I’m still new to chalk paint. I’ve only used homemade. I did buy a sample jar of ASCP, but couldn’t see a big difference. I assumed it was my inexperience. I may go back to just trying latex with primer again. By the time I put a couple of coats of paint to cover, I could have primed and painted. And I’m not a fan of the waxing, but want to explore the aging process with other products. I want to try the aging glaze by Valspar. It seems like that would be a little easier than waxing, since you are supposed to use a clear coat of wax before a dark coat. I have used latex paint for years. I love the look but find that the paint always seems “sticky”. Seems like it never really dries . How do you avoid this? I used latex paint for years and painted all my furniture white to obtain that shabby chic style. I have just recently started using DIY chalk paint and love it. It’s so easy to work with. I love your pieces and love to see what you are going to do each week. I use latex all the time. In fact, I have been painting furniture for over 10 years and that’s all I had to use at first. I have been using chalk paint but not so sure how I like it. I am not crazy about waxing. Your pieces are beautiful!